NASA’s proposed Orion spacecraft has taken another step closer to its planned 2017 launch with NASA announcing an agreement with the European Space Agency covering the craft’s service module. 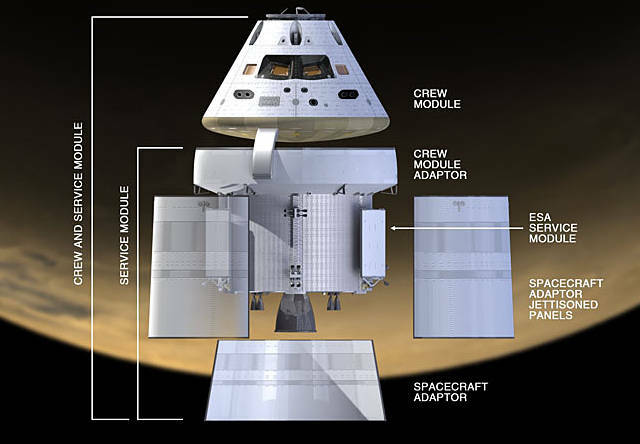 The service module, which would provide power, propulsion and thermal control to Orion, will be based on the ESA’s existing ATV platform which has had three runs to the International Space Station. Its post-launch propulsion capabilities will cover attitude control, orbital transfer and – if necessary – high-altitude ascent aborts, NASA says here. If NASA can get the jigsaw together – and presuming the project isn’t budget-cut to death by the US government – the first Orion mission would be an unmanned lunar fly-by in 2017. The first launch milestone for Orion will be a flight test in 2014, in which a Delta IV Heavy rocket will lift the spacecraft to 3,600 miles (around 5,800 km). This mission will use a test service module being built by Lockheed Martin. The ESA module will get its first outing in the 2017 Exploration Mission-1, which will end with whatSpaceref.com describes as the “fastest re-entry ever” at 11 km/sec.